NEW YORK – The two stone churches near the foot of Broadway, in the shadow of the World Trade Center, have seen fire and calamity and the sweep of American history, and through it all have kept their doors wide open. But in a sign of the times, Trinity Church and St. Paul's Chapel both installed metal detectors this month. 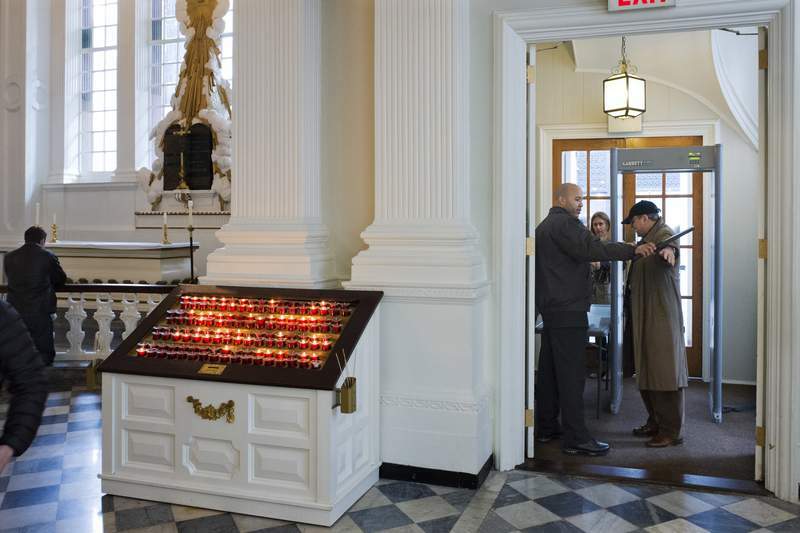 Visitors on their way to see Alexander Hamilton's tomb in Trinity's historic graveyard, or who want to sit in the pews at St. Paul's where George Washington prayed and dust-covered rescue workers rested after 9/11 attacks, now have to pass through airport-style security checkpoints. The metal detectors, installed March 1, will be there "until this world becomes a safer place," said Trinity's vicar, the Rev. Phillip Jackson. Visitors to St. Paul's passed through them Palm Sunday as they gathered to mark the start of Holy Week, which commemorates the story of Jesus' crucifixion and resurrection. Church officials said the decision to step up security was not a response to any specific threat, but Jackson said a terrorist attack in the fall, when a man used a speeding truck to kill eight people on a nearby bike path, was "kind of a wake-up call." "While no one wants to have to implement such measures, it's a reflection of the times we live in and our desire to keep our people – parishioners and visitors – safe," Jackson said. 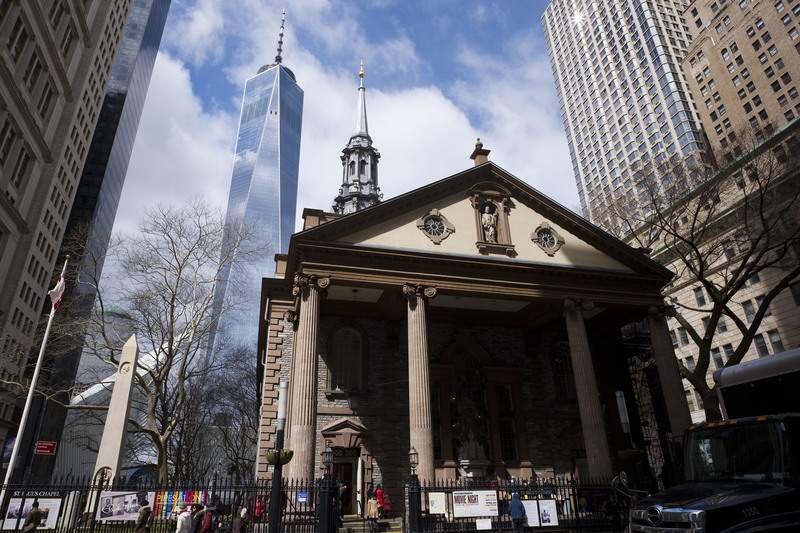 The two historic churches, which jointly serve a congregation established in 1697, are hardly alone in lower Manhattan when it comes to security measures. People visiting the Statue of Liberty, the Sept. 11 memorial or the observation deck at One World Trade Center all have to pass through metal detectors. The New York Stock Exchange closed to tourists altogether after 9/11. Yet the appearance of security checkpoints at two churches long seen as sanctuaries still struck some visitors as something new. "I thought it was weird," said Rosie Meeks, of San Antonio, who visited St. Paul's with her 9-year-old grandson. Kijuanna Winn, of Atlanta, said she had never seen metal detectors at a U.S. church before, though she was becoming used to seeing them elsewhere. "I think I've become more accustomed to that now in traveling, with so many different attacks and gun violence," Winn said. "It didn't bother me." The neo-Gothic Trinity Church was consecrated in 1846 after previous churches serving the congregation were replaced or destroyed, including a church that burned in a fire that destroyed much of Manhattan after the British occupied the city during the American Revolution. Trinity saw a new surge of visitors after the smash success of Broadway's "Hamilton," since Alexander Hamilton; his wife, Elizabeth Schuyler Hamilton; and Elizabeth's sister Angelica Schuyler Church are all buried in the picturesque graveyard. St. Paul's Chapel was built a few blocks up Broadway in 1766. George Washington attended a service there immediately following his 1789 inauguration as the first U.S. president at nearby Federal Hall. The church narrowly escaped being destroyed when the World Trade Center collapsed on 9/11, gaining the nickname "The Little Chapel that Stood." For months, it became a center for the relief effort. Volunteers met there to distribute food, water and spiritual counseling to rescue and recovery workers. For years, people left messages and mementos to the dead in the chapel's iron fence. Metal detectors remain rare at U.S. churches, even in security-conscious New York. St. Patrick's Cathedral, which gets an estimated 5 million visitors a year, does not have them. 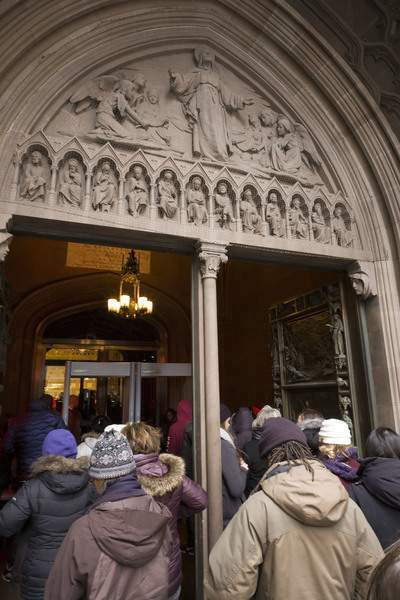 "We have security at the cathedral, of course, but we do not have metal detectors at the doors," said Joseph Zwilling, spokesman for the Roman Catholic Archdiocese of New York. Ron Aguiar, a Louisville, Kentucky-based consultant on church security and the author of "Keeping Your Church Safe," published in 2008, said many churches around the U.S. have armed guards, but he hasn't been recommending walk-through metal detectors. "The general consensus is we're not at that point yet," he said. Some synagogues in New York and elsewhere have installed metal detectors, to the disappointment of critics like Rabbi Philip Graubart, director of the Advanced Institute for Judaic Studies at the San Diego Jewish Academy. He said the "fortress" atmosphere "reinforces fear as a daily emotion." Asked about the metal detectors at Trinity and St. Paul, Graubart said they seemed like "a shame." "Unfortunately it's the madness of the world we live in," he said.